The human heart is about the size of a clenched fist. It contains four chambers: two atria and two ventricles. 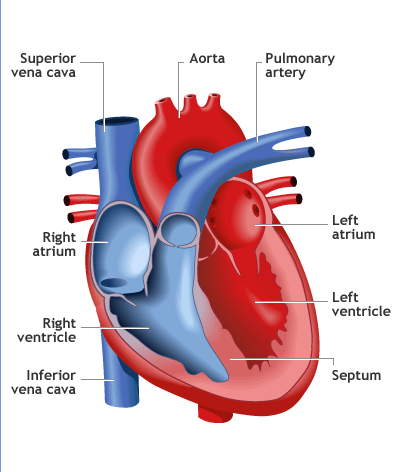 Oxygen-poor blood enters the right atrium through a major vein called the vena cava. The blood passes through the tricuspid valve into the right ventricle. Next, the blood is pumped through the pulmonary artery to the lungs for gas exchange. Oxygen-rich blood returns to the left atrium via the pulmonary vein. The oxygen-rich blood flows through the bicuspid (mitral) valve into the left ventricle, from which it is pumped through a major artery, the aorta. Two valves called semi lunar valves are found in the pulmonary artery and aorta. The cardiac cycle is controlled by the pacemaker - which is located in the top of the right atrium. The pacemaker is a type of nervous tissue. •Pacemaker sends an electrical signal to the cardiac muscle of the atria. •The electrical signal that came from the pacemaker then travels onto the cardiac muscle of the ventricles. Fibrinogen into a protein called fibrin, which forms a patchwork mesh at the injury site. As blood cells are trapped in the mesh, a blood clot forms. The lymphatic system is an extension of the circulatory system consisting of a fluid known as lymph, capillaries called lymphatic vessels, and structures called lymph nodes. Lymph is a watery fluid derived from plasma that has seeped out of the blood system capillaries and mingled with the cells. Instead of returning to the heart through the blood veins, this lymph enters a series of one-way lymphatic vessels that return the fluid to the circulatory system. Along the way, the ducts pass through hundreds of tiny, capsule like bodies called lymph nodes. Located in the neck, armpits, and groin, the lymph nodes contain cells that filter the lymph and phagocytise foreign particles. B-lymphocytes are stimulated primarily by bacteria, viruses, and dissolved materials. On stimulation, the B-lymphocytes revert to large antibody-producing cells called plasma cells. The plasma cells synthesize proteins called antibodies, which are released into the circulation. The antibodies flow to the antigen site and destroy the microorganisms by chemically reacting with them in a highly specific manner. The reaction encourages phagocytises, neutralizes many microbial toxins, eliminates the ability of microorganisms to move, and causes them to bind together in large masses. This process is called antibody-mediated immunity. After the microorganisms have been removed, the antibodies remain in the bloodstream and provide lifelong protection to the body. Thus, the body becomes immune to specific disease microorganisms.